Have you ever heard of a chicken moat? Do you remember watching movies that had a castle with a big drawbridge? Usually, underneath the drawbridge was a moat. What does this have to do with gardening, well, the moat around the castle was put there to protect it from enemies. As a gardener we can have something similar to this called a chicken moat. A chicken moat consists of two parallel fences that go around your garden area creating a run for chickens. The chickens will protect the perimeter from enemies, also known as bugs. They patrol the fenced in area, eliminating bugs by scratching up dirt with their claws uncovering unwanted pests, or bugs they see crawling their way to the garden. Although chicken moats are not heard of often they are trendy with gardeners who already have chickens and a garden. Trying to find gardeners who had one was quite a challenge, but with a little work I found some individuals willing to share in their triumphs. According to these gardeners, there are three benefits to having a chicken moat. Chicken moats have two fences that run parallel to each other, and if kept at 5' or higher with space of 5' or more, will keep deer from invading your garden. Gardeners who have had deer visit their garden know that they are destructive to the vegetables they want to eat and to those that they trample on. When you have chickens running around your garden they will eat most of the bugs that try to migrate in. Many gardeners have agreed that their crops had less pests due to having the chicken moat. A few have boasted that having a chicken moat has resulted in their best crops since beginning their gardening career. The chickens will provide rich fertilizer for next year's garden. You can make a compost to mix it with for the following year, or keep it to put directly onto the soil. 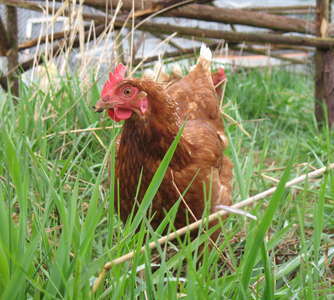 Chickens will keep weeds down around the fencing, too. Chicken will have to be of a heavy breed so that they can not fly out, or the gardener will have to clip their wings on a regular basis. The heavy chicken breeds still produce eggs, and make good meat. The materials for making a chicken moat are very expensive and time consuming. To help with the cost you could look around for old fencing that is in pretty good shape. A garden free of pests is dream come true for any gardener, even though a chicken moat can not guarantee complete removal it is a good aid in pest prevention. A better harvest is the goal of all gardeners, but the suggestions for success are numerous. If you use fertilizer, need constant acting pest control, and want to have, or already have, chickens. A chicken moat can put together all of these tasks so that gardeners can achieve a bountiful, almost pest free harvest. Spring is here. Birds have already begun to migrate back to their respective homes for the summer months. The myth goes that spring has finally sprung when the American Robin is out. If you live in northern states though, spring probably hasn't delivered much more than blistering temperatures and snowflakes. The first day of spring for many was more white than green. When birds are migrating they typically are low on food and supplies to build their nest. Sprinkle some seeds out so your fluttering friends will not go hungry. Sunflower seeds are a great alternative to wild bird seed. It is a delicate treat for birds. 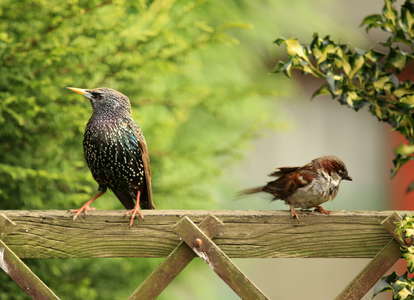 Wild birds will often eat sunflower seeds along with their wild seed, berries and insects. Remember to put some nest building tools out too. Nesting material refers to anything a bird can use to construct their home. Different types of birds create different nests. Some may be built with sticks and straw like the American Robin, where others may be more elaborate like the Village Weaver hanging nest. The size and shape is unique to the different breed of bird. The important aspect of the nest is to create a safe haven that allows a cushioned place for eggs to incubate. The nest also allows the family of birds to gather together for heat efficiency and protection from many predators. In the next couple of weeks as you are spring cleaning your home, don't throw away what seems like garbage but might make a home for birds. Gather items together and recycle them with nature so mother bird won't have to stray too far from her family to search for supplies. The material can be draped over trees, shrubs or other landscaping. You can even fill a bird house with the materials and seeds to ensure the birds only have to stop in one place. Remember to make sure materials are clean and chemical free. You wouldn't want to accidentally offer toxic resources. It is recommended to offer dry resources. Even though the birds nest may become wet, they are more likely to use materials that are dry initially. Make your backyard bird friendly by making sure there are a lot of trees, shaded areas, bird houses and plenty of food. Some say that hummingbirds won't visit a birdhouse if it is too close to wind chimes or decorative flags. It is the sound and movement that seems to frighten them. To be sure they don't get startled - try to keep these items approximately 20 feet from their bird houses. This way they will never be afraid to go home. By inviting birds to stay, you are able to see their remarkable lives before your eyes. You will see their courtship behavior, nest building tactics and how they raise their young brood. At first you may only invite a few birds, but it also presents the perfect opportunity to attract a wide variety of birds to your backyard. If a family senses you are a friendly companion, they may invite other families to join them. Heather Cherry holds a Masters in Professional Writing from Chatham University. She is a 4-H Youth Leader of a writing club to help inspire and shape young writers with their dreams. She is a member of the Kane Area Chamber of Commerce, the Kane Garden Club and the Route 6 Tourist Association where she serves as Administrative Assistant. Heather has spent most of her life involving herself in writing by authoring a young adult fiction novel titled Angst, authoring blogs on her website, www.cherryconsulting.com, beginning a writing and communication consulting business, reporting for her local newspapers The Ridgway Record and The Bradford Era as well as writing a variety of articles for many different outlets. Heather and her husband Steve live in rural Pennsylvania where there isn't much commotion other than the rustling trees. Here they raise their son, Troy. As the growing season approaches, I prepare to start some plants from seed. There are many different vessels to start your seeds in, and eggshells are one of them. Generally I obliterate my eggshells when I am making eggs or baking, so collecting these fragile seed pots has been particularly challenging for me. However, once you have gotten a clean break in your shell you have made it through (in my opinion) the most difficult part of the prepping process. After some trial and error, and some internet research, I have found that the simplest way to get your eggshell seed pot is to begin by puncturing the top of the egg. When I say the top, I mean the part of the shell that is narrower. You do not need any fancy tools for this, a steak knife will do. Once you poke your hole, you can use your hands to break off the top fourth of the egg. Using your hands grants you control and will increase your chances of preserving the rest of the egg. Do not get discouraged if you do not get it right the first few times - it can take practice to develop a touch delicate enough for an eggshell. I make collecting shells a casual process, doing so only when I am baking or cooking. However, there is nothing wrong with making a project out of it and having a go at the whole carton. Once you have a hole in the top of your shell, the next step is to empty out the egg into your cake batter or wherever you have chosen for your egg to go. Turning the sink water on to low pressure, I run my thumbs gently around the inside of the shell to separate the membrane, which I discard in my compost bin once removed. I have found that the water helps with the membrane removal. In order to make sure you do not drown your baby plants, you should poke a small hole in the base of your shell. I was pleasantly surprised at the great results I got from simply using a nail and the pressure of my hand. There are special tools you can use, but that certainly is not necessary for this step. Bringing the nail to the inside of my egg, I applied a small amount of pressure until the tip came out the other side. My first try was successful, but again, it is okay to have a little trial and error as a part of the process. Now you have a clean eggshell seed pot! Hang on to the carton, because it serves as a great shell holder and a perfect way to stabilize your shell once you have started your seeds. What are the benefits of using an eggshell to start seeds? Eggshells are likely something you throw into the garbage or compost. Using them as seed pots is another way to recycle! You can place the eggshell directly into the ground with your baby plant when the time comes. The shell adds nutrients to the soil, which will enhance the quality of your garden. Eggshells have calcium, so they are an especially great starter vessel for tomato plants, which need high levels of calcium for proper fruit formation. Eggshells are just one of many containers you can start your seeds in, and they are definitely one of the most ecofriendly choices. Creating your shell pot is free of cost and accessible to anyone who includes eggs in their meal plan, making it the perfect option for the economically and environmentally minded individual. Cabbage loopers and cabbage moths are one of the most damaging garden pests and can devastate a garden in only a few days. They are especially attracted to brassicas like collard, cabbage and broccoli plants but are known to devour turnip leaves, spinach, cucumbers and even tomatoes. They can be found throughout North America and have been known to overwinter in southern states. How do you know if there are Cabbage loopers in your garden? The loopers are the larval form of the white cabbage butterfly, and their appearance is often the first sign that an infestation may be on its way. The small, white butterflies usually only appear in the night, which is why most infestations are not found until the damage appears on leaves. Cabbage moths will lay eggs on the underside of leafy plants, which is why brassicas, with their thick, fibrous leaves are a preferred sanctuary for loopers. When the larvae appear they are initially a milky white color and will develop into plump green caterpillars, with faint white stripes on the sides of their back. Once they have reached the larval state these eating machines can consume more than three times their weight in a single day. If they are not discovered early, the caterpillars become very difficult to control. There can be anywhere from 3-7 generations of caterpillars throughout the growing season depending on the temperature. Keep Clean: Cleaning up your garden at the end of the season is more of a preventative measure. Make sure that any greenery and debris is collected, removed and disposed of before winter sets in, as the cabbage looper is known to overwinter in gardens. If you have a larger garden it may be worth tilling before the ground hardens, just to make sure you got every last one. Pick'em: Some people are very turned off by the idea of handling these squishy little pests, but if you only have a few, it beats investing in other expensive and time-consuming alternatives. Just throw on a pair of gloves, grab a bucket and diligently search every leaf (it could all be for naught if you leave even one). Make sure to dispose of the critters far away from your garden, and your neighbors'. If you already have a large infestation, this may be an exercise in futility and you may want to look at some of the other options. Flowers and Herbs: Plant strong smelling flowers and herbs like marigolds, nasturtiums, mint and chives around the other plants in your garden. These odors deter insects, including cabbage butterflys, from entering the garden and laying eggs. Floating Row Covers: So they are not the most attractive addition to any garden, however, if you are struggling with the voracious cabbage looper, they might be worth a second look. Floating row covers are a light-weight fabric made from polypropylene and polyester that you drape over plants and secure to the ground with rocks, lawn staples or other materials you have handy. They are common enough that you can pick some up at your local garden center and are less pricey than other pest defense options. As long as you get them down before the cabbage moths have a chance to lay their eggs, and there aren't any overwintering in your garden, you will be caterpillar free for the season. 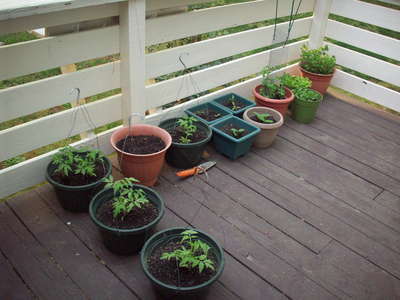 This method works particularly well for long rows of plants. The big pros to floating row covers is they protect against frost and keep plants warmer, which increases growth rates, and you can water directly through them without having to remove or reapply. When using row covers, make sure you leave enough slack for your plants to grow. DIY Bug Deterants: Certainly a more appealing solution to organic gardeners than chemical insecticides, making your own deterrent spray can be effective and easier on your wallet. In a sprayer bottle, mix liquid dish detergent, hot sauce, vinegar and water and apply the brew on the tops and bottoms of your plants' leaves. This mixture will not kill any hungry caterpillars, but the taste and smell will deter them from munching on the coated leaves. This is usually an effort that must be combined with other methods of fending of the loopers and, in most cases, will not be 100% effective on its own. Bacteria: It sounds scary but there is actually a naturally occurring bacteria that is known to attack caterpillars and only caterpillars. It is known as Bacillus thuringiensis, or BT. Most gardeners consider BT an organic alternative to other store bought pesticide products and it is very effective against cabbage loopers. Certain strains of BT affect caterpillars the same way other bacteria affect humans. In this case BT poisons the caterpillar by way of its stomach, therefore the caterpillar must ingest BT for it to be effective, so timing is everything. It is commonly sold as a powder that you can then mix with water and spray over your plants. Keep in mind that more than one application may be necessary. BT is a living organism and can only live outside of a host for a few days to a week and too much rain or sun can also reduce its effectiveness. While BT can be the most effective solution to cabbage loopers, it is not a miracle product. One of the downsides of BT is that it can adversely affect other caterpillars, including butterfly larvae. Research the product before purchasing or applying to your garden so you make sure you are using the correct strain and understand the application process. There is no absolute solution to dealing with any pest in the garden and cabbage loopers are no exception. However, with the gardener's spirit and a little hard work your cabbage looper problems will become a thing of the past. Continue reading Defending Your Garden Against Cabbage Loopers.